There are some times in a year (or maybe a month)when you have been partying hard. Parties mean friends,food,drinks,feasting and mindless eating. And however hard you try sometimes it becomes really difficult to say ‘no’ to a friend who has been sweating it out in the kitchen whole day and excitedly dishes out his/her delicacy for you to taste. It is when this partying ends,that the guilt of consuming high calorie and the not so nutritious diet overpowers you.It is during those guilt pangs the word “Calorie hacking’ (which I came across in a fitness column)comes to my mind. ‘Calorie hacking’ is a term which has taken over the world of fitness enthusiasts. It is a simple practice of hacking or chopping out the calories from the diet to affect weight loss.They vouch by the fact that making small hacks to your daily routine can make a big difference in the long run. Slashing the sugary drinks and alcohol from the diet,grilling and boiling the meats and veggies instead of deep frying, ditching the elevator for stairs,substituting fast foods with home made foods and watching your daily News while walking on the treadmill could be some effective hacks for a healthier lifestyle and achieving our fitness targets. 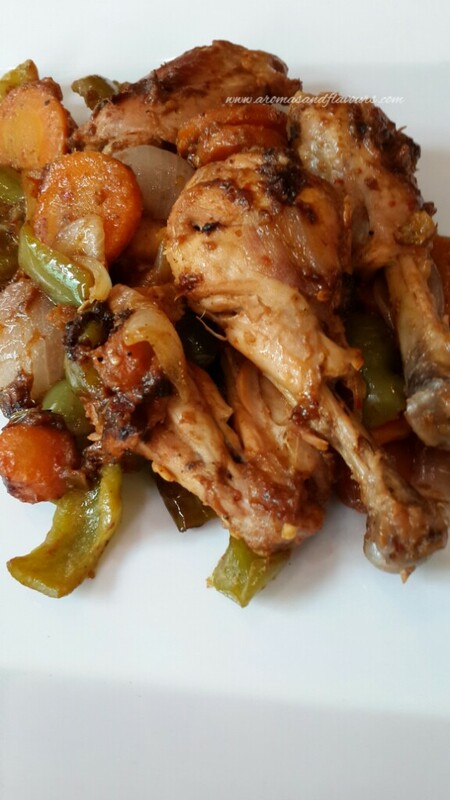 This chicken recipe is a healthy but delicious one because it requires minimal oil and has healthier vegetables like carrots and bell peppers instead of the popular fatty potatoes. It is simple to make and you are even hacking on the time used for outdoor grilling. Marinate the chicken with all the above ingredients except the vegetables. 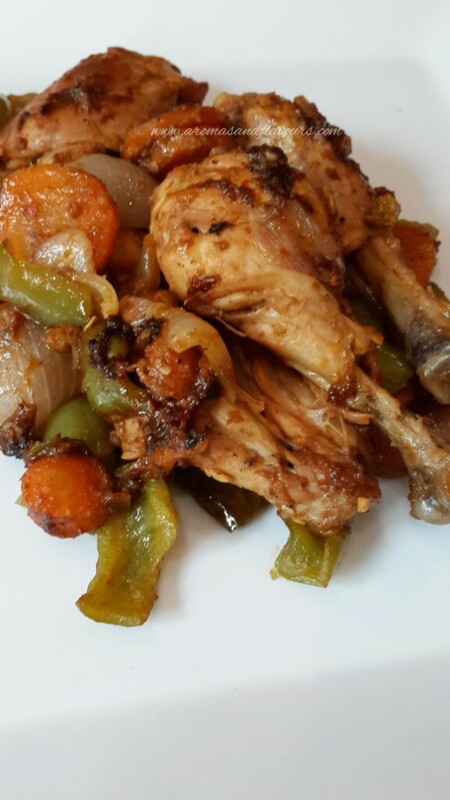 Spray some vegetable oil on a non-stick pan and put in the chicken along with the marinade. Cover and cook on low heat till half done. Now toss in the vegetables and cover the pan. Cook further on low heat till done. Note that the chicken should be tender and the veggies have to be half done to stay slightly crunchy. And I found the video amusing so couldn’t stop myself from sharing. Cute video! Dish sounds yummy too!!! Yes, for all of us to remember!!! Being food bloggers perhaps we need these hacks all the more in our lives 😉Thank you. Please do try the recipe. Simple and delicious. Thank you so much Donna. I am deeply humbled by your kind gesture. I would love to collect the award. This looks delicious! I’ve not heard of calorie hacking before, but since I recently started a new diet to try and lose weight I should probably get familiar with it!! I like everything about this. Reduced calories foods like this are just delicious and you would never miss those extra calories. Wow Thank you so much dear Lina. Thats very kind of you. I will love to collect the award.